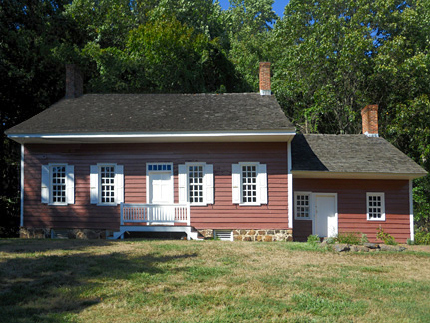 At the time of the Revolutionary War, this was the home of Garrett Hendrickson, a wealthy and prominent local citizen. Hendrickson served as a Lieutenant in the 1st Regiment of the Monmouth County Militia. As an officer in the Monmouth County militia, much of Hendrickson's wartime experience involved fighting against Loyalist raids. Loyalists were Americans who remained loyal to the British in the Revolutionary War. Violence between Loyalists and those who supported Independence happened throughout many parts of New Jersey, but Monmouth County was a particular hotspot for this type of fighting. Raiding parties of Loyalists (also called Tories) attacked Monmouth County many times. "[The raiders] visited the houses of sundry persons in the neighbourhood, from whence they took off upwards of twenty horses, five sleighs, which they loaded with plunder, and eight or nine prisoners.... At Garret Hendrickson's, having entered the house and made him prisoner, they went to the barn to take his horses and sleigh. In the mean time, two young men, his son and one William Thomson, who slept in the second story of the house, being awaked by the noise below, secreted themselves till the enemy were gone to the barn, and then came down, escaped and went to the house of Capt. John Schenck, of Col. Holmes's regiment, whom they alarmed about an hour and a half before day." Captain Schenck and some militiamen pursued the raiders and some fighting ensued. Hendrickson either escaped during the fighting, or was held prisoner for a short time after. The Revolutionary War officially ended a little over a year later. The Holmes-Hendrickson House was originally located about a mile from here on Crawford's Corner Road. The property was acquired by Bell Labs in 1929, and in 1965 they moved the house to its current location. 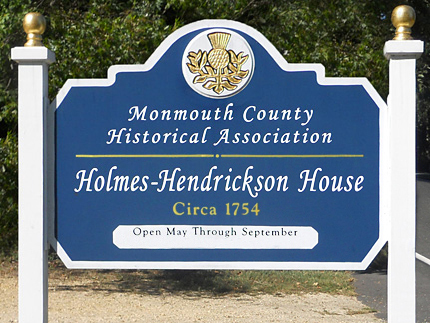 It is now operated by the Monmouth County Historical Association and open to the public for tours. ▸ Adelberg's book is recommended to those who would like to read more about Loyalists in Monmouth County during the Revolutionary War. For more information about the book, see Michael Adelberg's website. • Michael Adelberg, The American Revolution in Monmouth County: Notes to Accompany the Book and Additional Essay (For the Monmouth County Historical Association, November 2010) Pages 2-4. (Adelberg includes a large list of sources for his information beginning on the bottom of page 3). ▸ Contains an account of the May 27, 1778 raid. ▸ Contains an account of the June 21, 1780 raid. Available to be read at the Internet Archive here. Available as a PDF on the Monmouth County Historical Association website here.